Serene Modern is a mobile capable style set for v7.6 (it should still function within v7.5), which has been based off of our Serene style set for v7.5. There are no images in the Serene Modern set, instead there are CSS3 gradients. 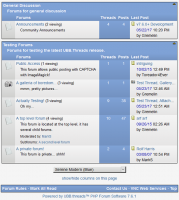 Return to the Category "UBB.threads v7.6 - Serene Modern"